When I arrived at Mum’s London flat I almost immediately announced (after asking how everyone was): ‘We can make cannoli while I’m here Mum! 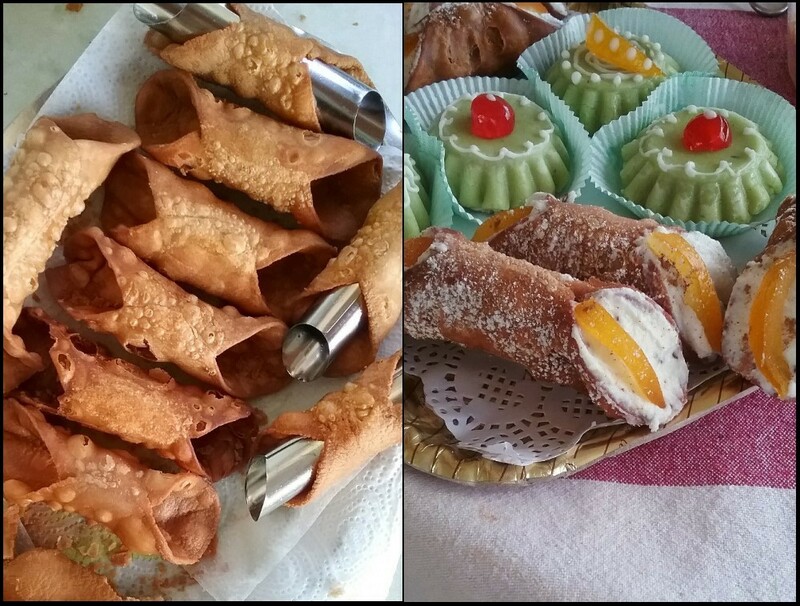 I’ve learnt how to make cannoli!! !’ (big grin). But sadly it was not to be. One day later there was a new baking announcement: ‘Oops, I forgot the recipe back home in Barcelona. Can’t make Giana’s cannoli!! 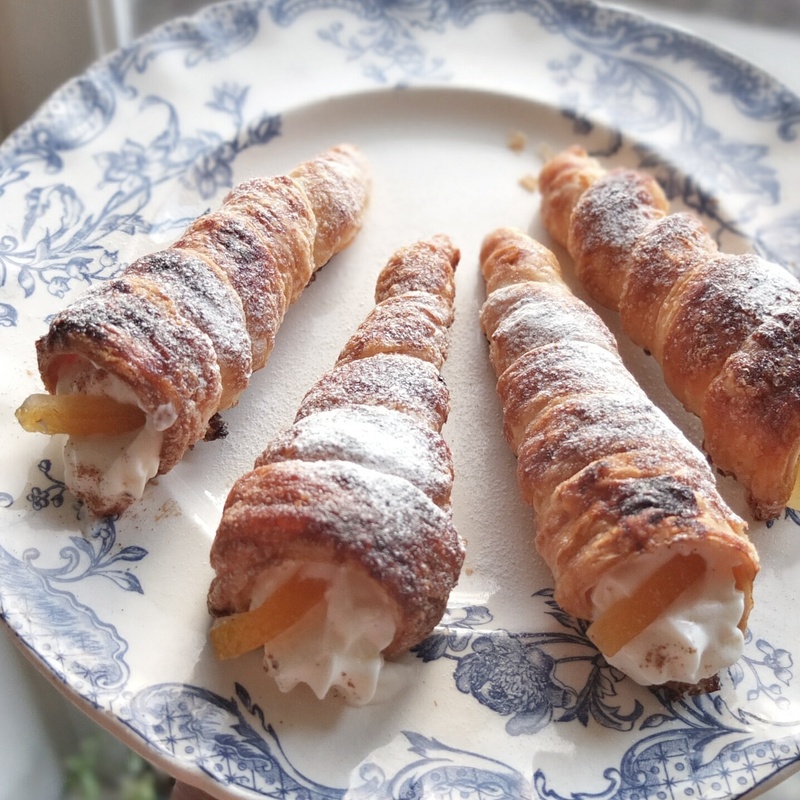 !’ But I did have a partial recipe for the cannoli cream saved on my tablet and 6 unfilled puff pastry horns I’d brought with me from Barcelona. Yes, this sounds a little odd I know. I’ll just explain the presence of these horns. 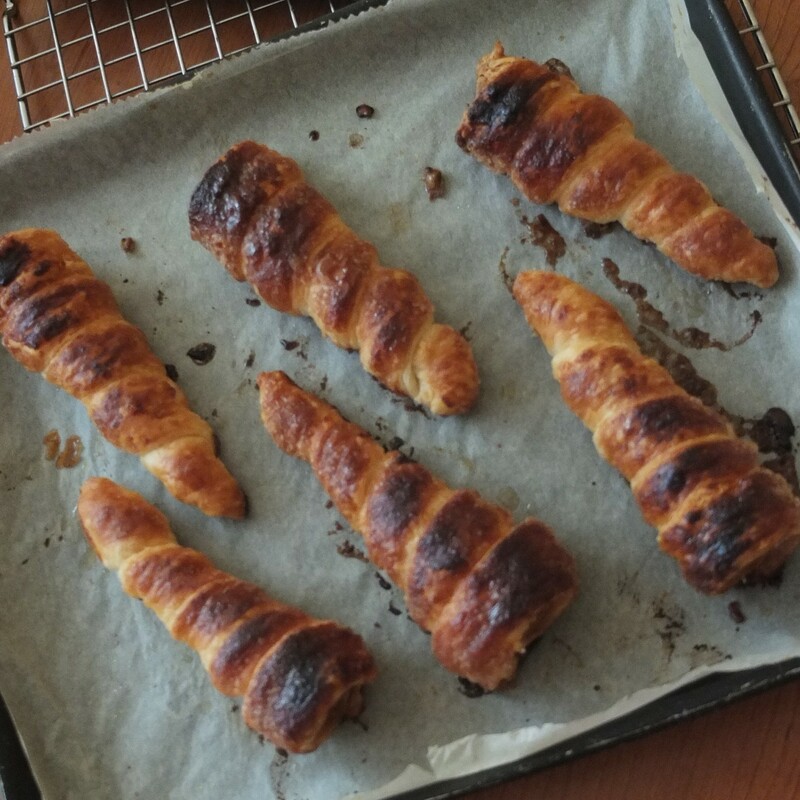 Well, the morning before travelling to London I finally got round to making these to use up my homemade puff pastry, which I didn’t want languishing in the freezer for 1 more month in my absence. 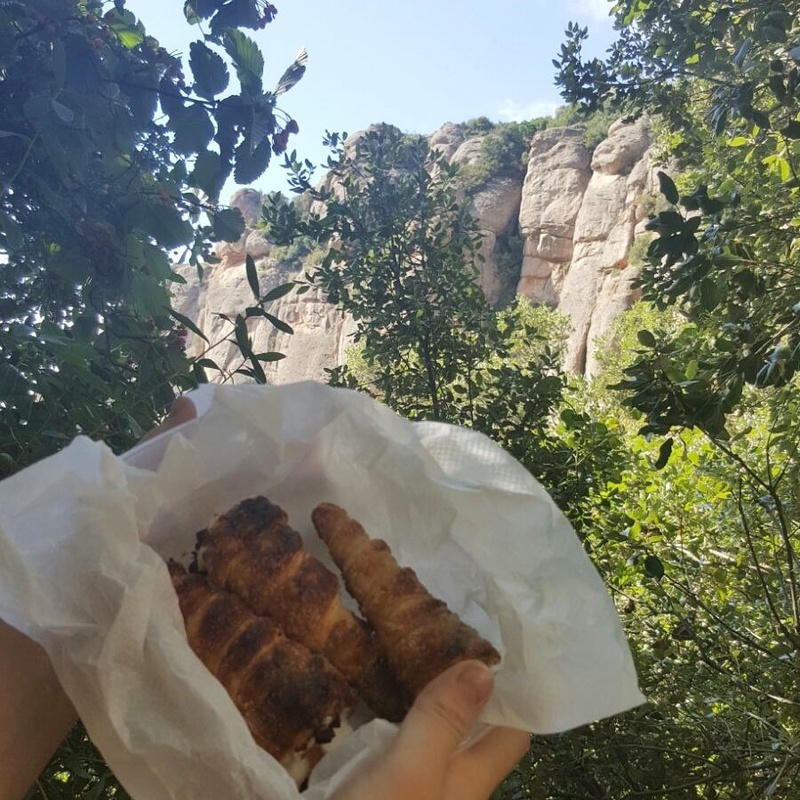 But I realised filling them in Barcelona meant rushing around the kitchen like a mad woman (and possibly missing the plane) then carrying cream-filled pastry, rapidly getting softer not to mention pretty messy. The solution was clearly to take them to mum’s unfilled and they survived the trip really well. And tada! The pastry horns came to my rescue when looking to house traditional cannoli ricotta cream, demonstrating that necessity truly is the mother of invention. The marriage between the light crispy horns and creamy ricotta is a beautiful one so I was happy to make them twice more (just to tweak and check, ahem) finally coming up with a healthier mesquite version too! Mesquite comes from the tree (of the same name) – its seedpods are ground into a flour-like powder with a pleasantly sweet maple syrup-like flavour though at the same time it’s quite strong and a little earthy. It can be used to replace flour and also as a sweetener. Apparently it’s rich in calcium, magnesium, maganese, potassium, iron, zinc, protein and lysine plus it helps stabilise your sugar levels! 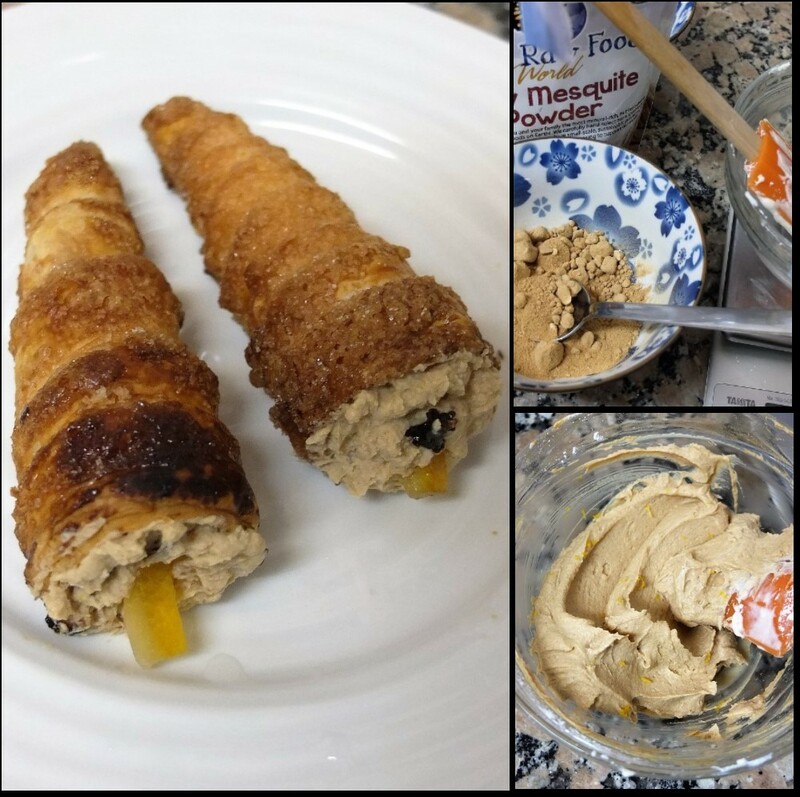 You can read more about it in Mesquite Powder… the Secret Ingredient and 4 healthy sugar alternatives: Stevia, Lucuma, Mesquite, Xylitol. The article Top 6 healthy sugar alternatives also gives tips on how to use mesquite in baking. Just before the recipe (coming soon!) here’s a little inspiration in the shape of my September bakes. 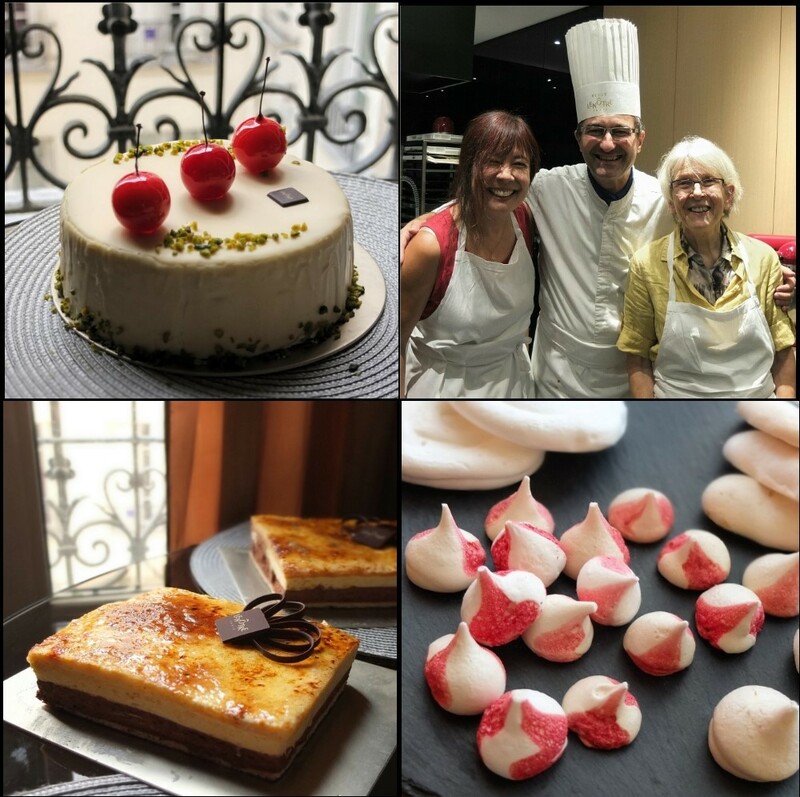 I spent the month travelling around Birmingham, Wales and Paris with mum, attending two baking courses in Paris to produce a cherry confection and a vanilla and chocolate mousse cake, which will be tweaked and adapted in the future. And with my niece in Birmingham we tried out vegan aquafaba meringues with the murky liquid from a can of chickpeas, which was fascinating especially if you like scientific experiments. And very handy if you’re vegan. But now let’s make those cannoli horns…! 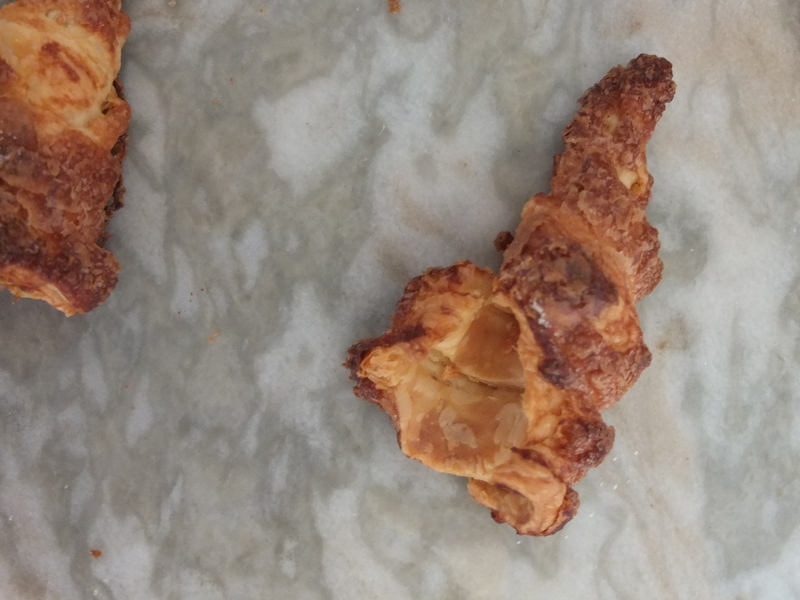 I found it difficult to find a detailed step-by-step recipe for puff pastry horns, so mine are mostly based on trial and error, with a little pastry common sense. The cannoli cream is based on Giana’s recipe, which means it’s delicious and not too sweet. 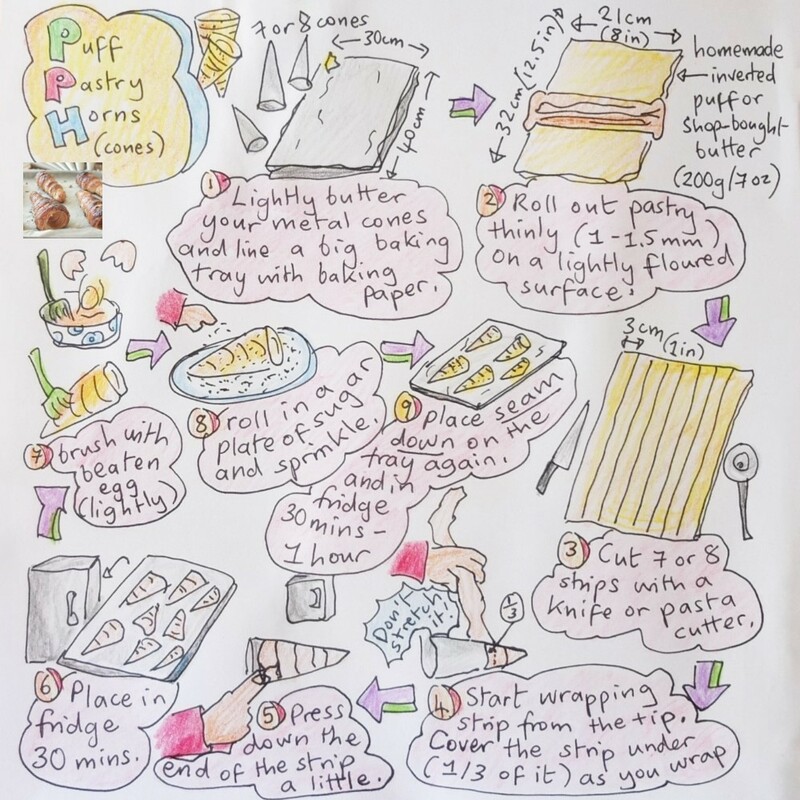 Here are some tips arising from the kitchen experiments. I prefer homemade inverted puff pastry as it tastes delicious and holds very well. You can follow the inverted puff pastry recipe in my basics section. But you can also use shop-bought all-butter or 20% butter puff pastry. I tried some and though it didn’t taste as good the horns were fine once filled with the cream. Also, if you buy ready-rolled you have conveniently even thin pastry (just roll it out a little thinner) which helps make nice horns. Your pastry needs to be rolled quite thin (1mm to 1.5mm) or it will be difficult for it to cook through. Don’t stretch your pastry when you wrap it around the metal cone, because this can encourage holes to appear later. Make sure your final seam (where you stick down the last of your pastry) is underneath so face down on your baking tray. If the seam is on top it can come undone and you could get this sad horn. Sob. Make sure you chill the horns in the fridge between stages so the pastry keeps its shape better in the oven. 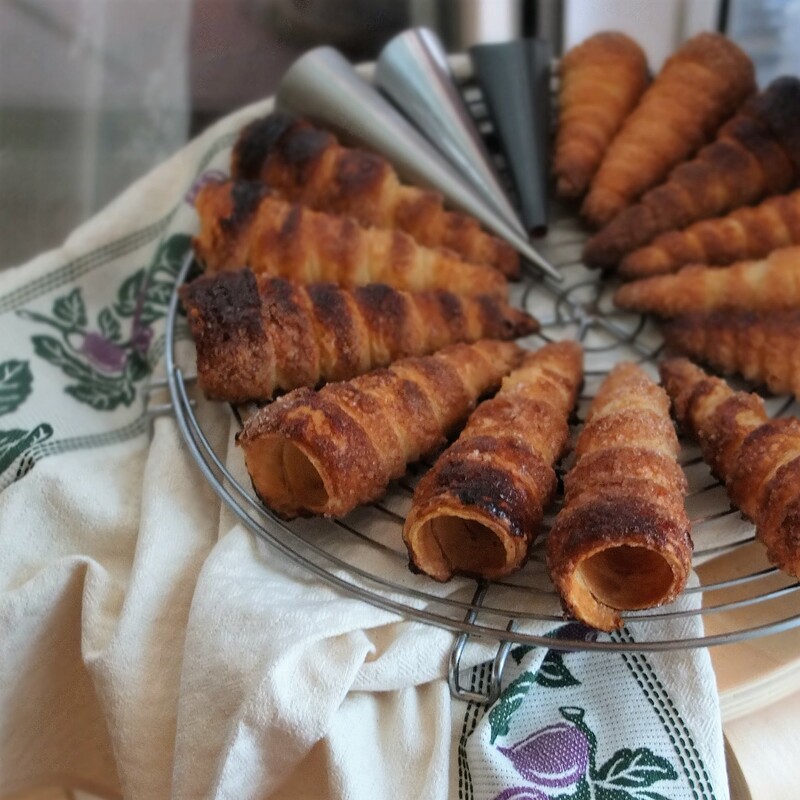 After 10 to 15 minutes baking, it’s best to remove the metal cones from inside then bake another 5 to 10 minutes until you see the pastry has browned inside the horns too. This is something I decided to do so there would be a better bake all over. As in a lot of French baking, the pastry can get quite dark and look a bit burnt in places, but the taste is preferable to having pale undercooked pastry. As you can see in the photo I tried 3 kinds of metal cones and they all worked equally well. The big cone that has a flat rim is helpful because it stands up upside down, but this isn’t necessary. It’s important to drain the ricotta first and prepare the ricotta the day before so it becomes firm for filling. My initial prototypes were delicious but you can see the cream (made on the same day) is a bit soft. 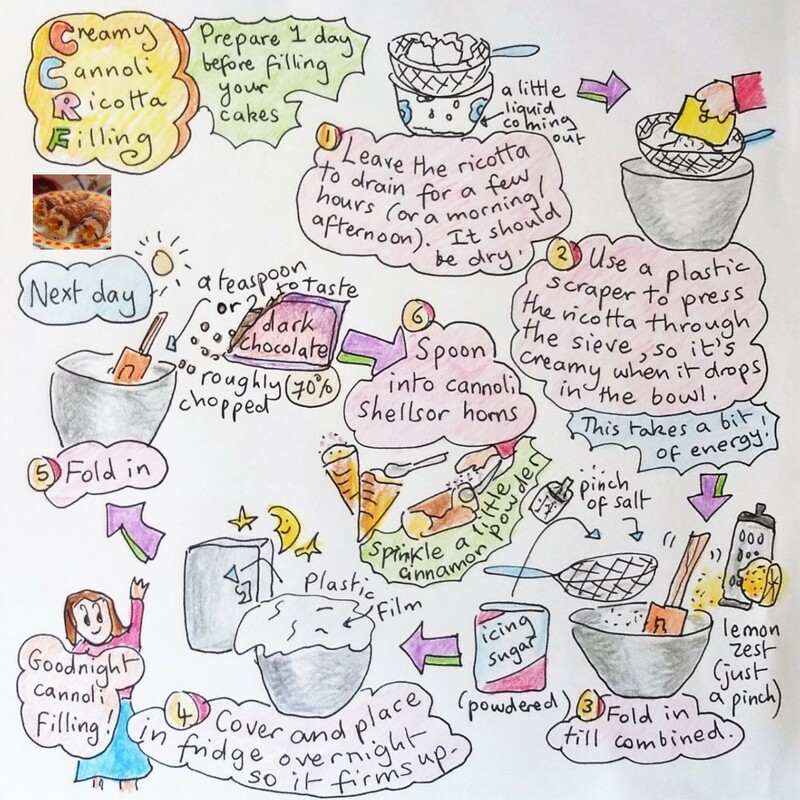 There’s chocolate and orange peel folded in so there’s no point piping into the horns – it doesn’t get to the bottom and the pieces clog the nozzle up. Spoon in with a long teaspoon then push in to the bottom with a chopstick (this works!). Oh, and add a short slice or two of candied orange at the ends in the cream! Or, as my cake testers suggested, chop the candied orange and mix into the cream before filling. Preheat the oven to 200°C/400°F (static, non-convection oven) or 180°C/350°F (fan-assisted/convection). Bake 10 to 15 minutes then take out the metal cones and bake a further 5 to 10 minutes until the pastry is lightly browned inside and out. Outside the pastry might be a little dark but that’s okay. If you’re worried about how it looks sprinkle a little icing sugar over your horns after they’ve cooled. Allow to cool completely before filling, using a long teaspoon preferably and a chopstick to push cream (with the pieces of dark chocolate) down right to the bottom of your horns! Remember to add the candied orange and sprinkle a little cinnamon over the exposed cream. Yum yum. The healthier ‘mesquite’ superfood version was an extra experiment. Mesquite has a very strong caramel-like and quite an earthy taste so I couldn’t totally replace the icing sugar with it, but there’s less than half the amount of sugar than in the original version (50g compared to 120-130g!). The balance between the two created a delicious flavour and the mesquite thickens the cream considerably, but in a good way. The mesquite powder also dominates so the classic cannoli taste disappears but these ‘healthier’ horns become delicious in their own right with a rather delicious special flavour. I had been thinking of throwing the remaining potent cream away (sorry) but suddenly found myself strangely addicted to it, so had another mesquite horn. 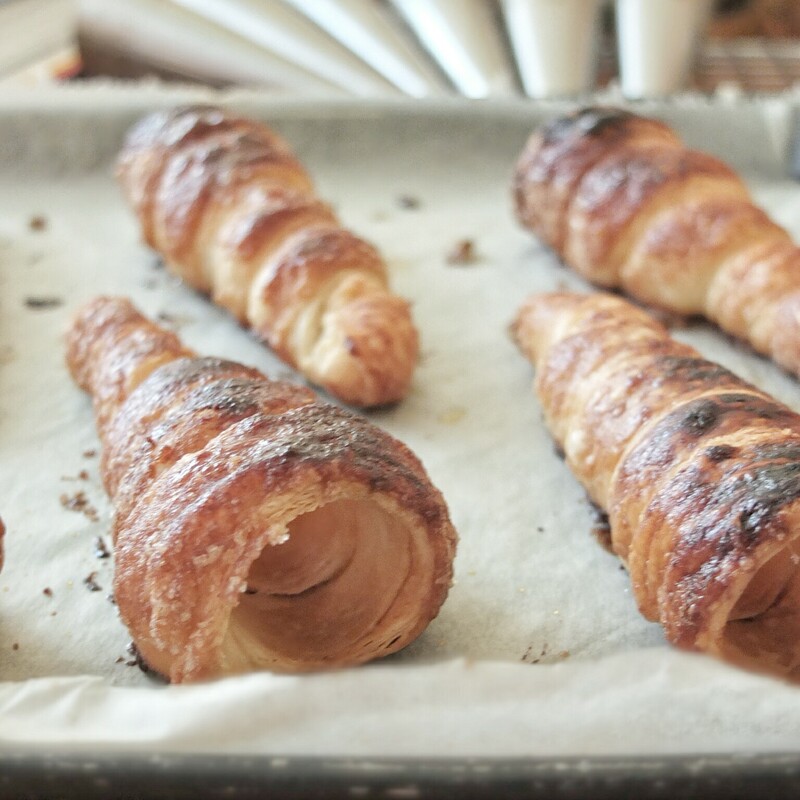 Like most puff pastry confections, it’s always better to fill these horns just before eating. But I’ve eaten filled ones 1 or 2 days later and they’ve still been very nice! Store in the fridge in an airtight container. And they might not seem like typical cakes for a trip in the wilderness, but we really enjoyed them in the mountains for a pre-climbing breakfast! So yummy. 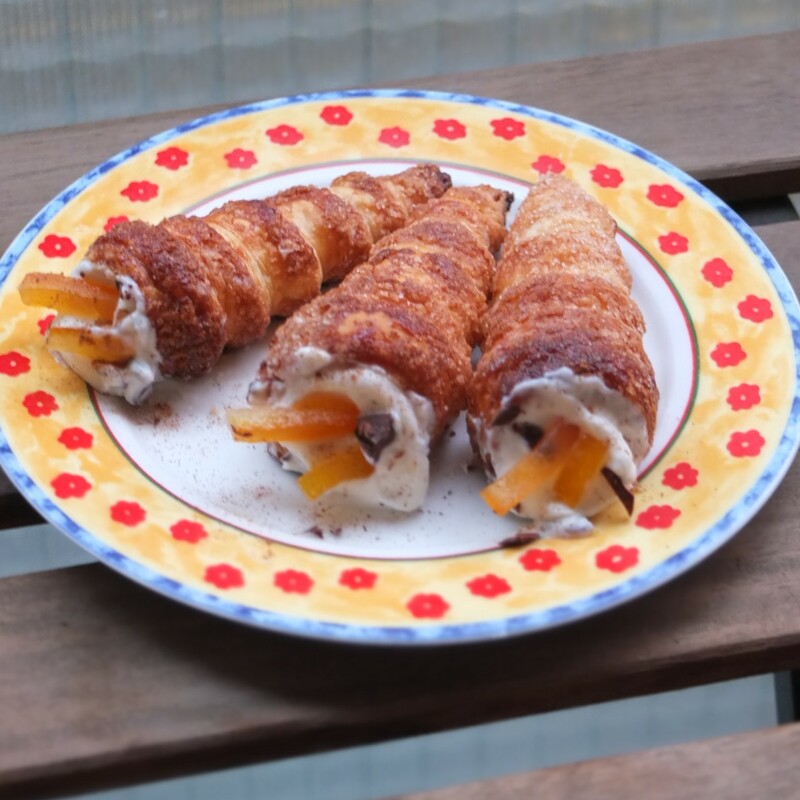 Hope you’ll help yourself to a lovely light cannoli cream horn too! 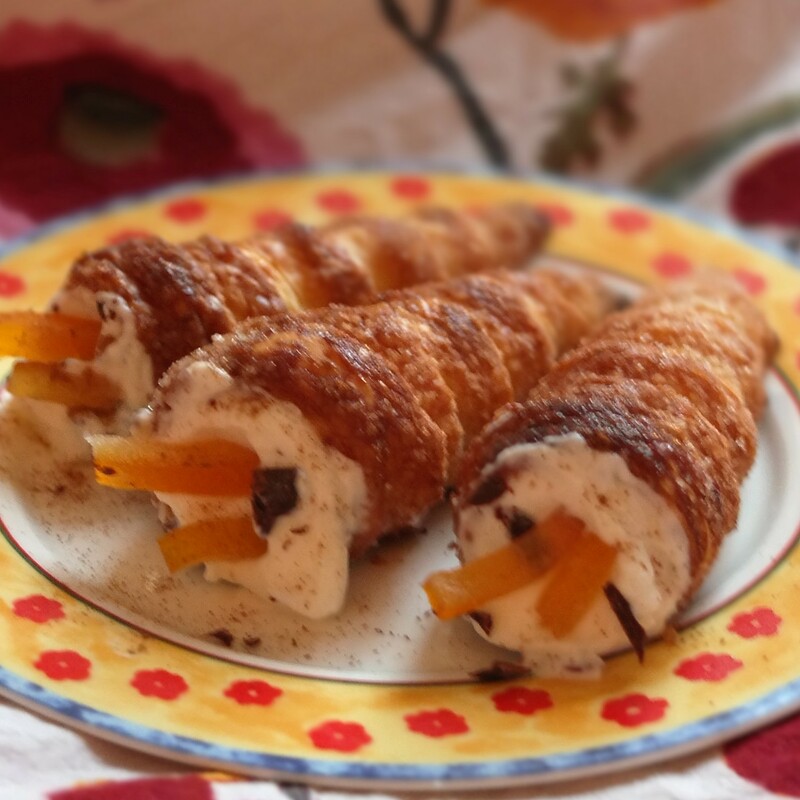 Have a cannoli cream puff pastry horn! The puff pastry hones are the best! oh my…what an amazing culinary lesson. 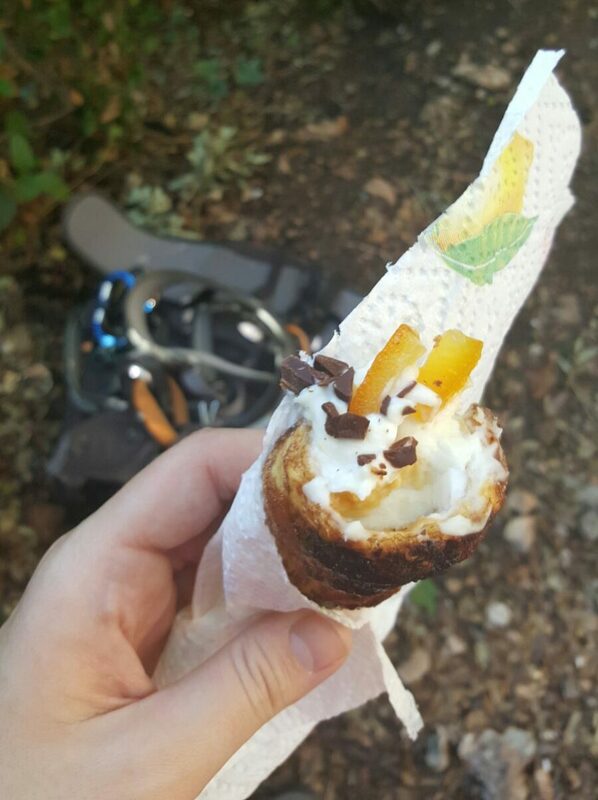 This cannoli’s look amazing. I am not sure I could recreate these so perfectly but will try for thanksgiving dinner!